I just completed the upgrade of my test environment to version 1.7.02 (easy) and validated the modules do indeed perform well in this version. Try it for yourself – My test site. As always, let me know if you have any questions. I just completed the needed updates to the fedex freight, fedex frieght ltl, ups freight ltl so that they work with the latest version of Magento (1.6.x). Please see the appropriate module page to purchase the patch. One of the problems with getting UPS freight LTL integrated within your Magento (really any eCommerce solution) store front is UPS’s rigid requirements to promote your UPS Freight LTL SOAP account to a production status (ability to use their ‘production’ freight calculator). They require you to send a very specific SOAP request to their test server. The test server will analyze the request, and if all is good, your account will be promoted. Promotion to production is VERY important. Until now, my customers who purchased my UPS extension, had to follow some tedious documentation to request promotion. Lots of steps… Things like setting up temporary products, dummy addresses, etc… Most of the time, I ended up having to get involved to assist. The latest release of the extension now includes a test mode to request a production key. 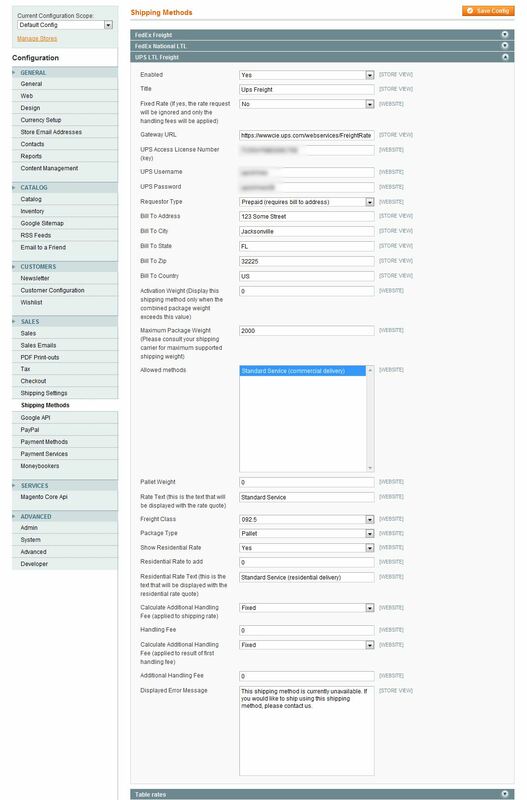 You simply set a flag in your extension’s config screen and request a quote. The extension itself prepares the SOAP request in the format required to gain production access. The request goes off and UPS responds with a generated quote in the cart. This quote is used to complete the remaining screens on the UPS site to request production status. I added several screen shots from both magento and the UPS site to help walk you through the process within the included documentation. Problem with Magento v1.4.1.1 upgrade? The latest Magento upgrade to version 1.4.1.1 causes a naming conflict within the FedEx freight and LTL shipping extensions. If you have purchased the extension in the past and wish to upgrade to 1.4.1.1, you will need to install one of the patches below. Why am I charging for the patch? Well, because I had to spend time debugging the issue, creating the fix, and setting up a process to distribute the fix. All of that takes time. Note that the patch has been integrated into the current extension downloads as version 1.2.2 (i.e. if you’re purchasing the extension for the first time, the patch is not needed). I just completed work on a Magento UPS LTL Freight extension which will query UPS Freight’s web services for rates and display them during the Magento checkout process (and shipping estimate). This interface was a bit more complicated to get working as I was unable to find any UPS freight interface examples using PHP. UPS’s freight service is also different from FedEx in that they use soap and ssl and I had a hard time getting the underlying Zend framework’s soap wrapper to cooperate. Anyway, I have it working and I validated the rates against their rate calculator and it is working well. I have a few things to still cleanup and some documentation to write (mostly around how to obtain a Freight access key). Special thanks to Shannon at kimessteel.com for partnering with me to get needed account info from UPS. Check back later for updates. I hope to be completed within the next week or so.